Mobility is a basic principle of modernity besides others like individuality, rationality, equality and globality. Taking its cue from this concept, this book presents a movement that begins with the macro-social transformations linked to mobility and ends with empirical discussions on the new forms of mobility and their implications for everyday life. The book opens with a study of the social changes unique to the second age of modernity, with contributions from Ulrich Beck, John Urry, Wolfgang Bonss and Sven Kesselring. It continues with a discussion of the implications of these changes for sociological research. Authors such as Vincent Kaufmann, Weert Canzler, Norbert Schneider, Beate Collet, Ruth Limmer and Gerlinde Vogl focus on a series of field examinations, both qualitative and quantitative, of emerging mobilities. The book is a foray into the exciting new field of interdisciplinary mobility research informed by theoretical reflection and empirical investigation. 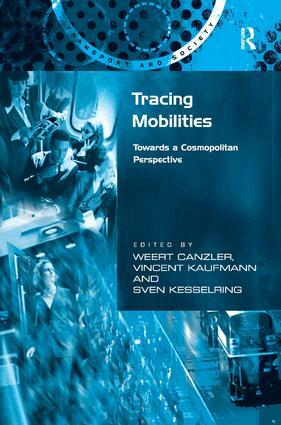 Contents: Preface; Tracing mobility - an introduction, Weert Canzler, Vincent Kaufmann and Sven Kesselring; Part I Tracing Mobility Concepts and Theory: Moving on the mobility turn, John Urry; Mobility and the cosmopolitan perspective, Ulrich Beck; Between social and spatial mobilities: the issue of social fluidity, Vincent Kaufmann and Bertrand Montulet; The wahlverwandschaft of modernity and mobility, Stephan Rammler; The mobile risk society, Sven Kesselring. Part II Finding Traces in Mobility Practices: The paradoxical nature of automobility, Weert Canzler; Job mobility and living arrangements, Norbert F. Schneider and Ruth Limmer; Working away from home: juggling private and professional lives, Estelle Bonnet, Beate Collet and Béatrice Maurines; Networks, scapes and flows - mobility pioneers between 1st and 2nd modernity, Sven Kesselring and Gerlinde Vogl; Gateways for research - an outlook, Weert Canzler, Vincent Kaufmann and Sven Kesselring; Index. Weert Canzler is from the Department of Innovation and Organization at the Wissenschaftszentrum Berlin, Germany. Vincent Kaufmann is Professor of Urban Sociology and Analysis of Mobility at the Laboratoire de Sociologie Urbaine, EPFL Lausanne, Switzerland. Sven Kesselring is at the Technische UniversitÃ¤t MÃ¼nchen, Germany.